Watchful eye of our friend Nichole Clay caught this from an article published in the 01 September 1978 edition of the Kentucky New Era. 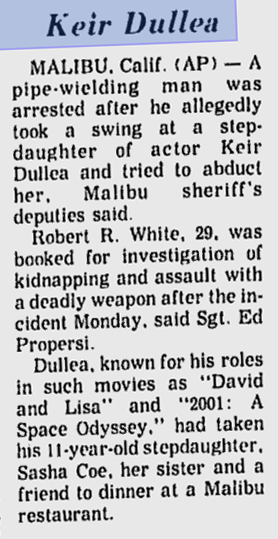 Apparently someone tried to abduct Keir’s step-daughter Sasha Coe from a restaurant Keir had taken his step-daughters to for a dinner out. I cannot imagine the fear that must have come into his heart at this. Let alone the fact the nutbar was wielding a pipe. 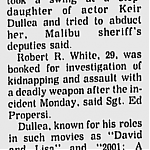 In a followup I found on the incident, dated 10 December 1978, the man had been judged sane by a Los Angeles court to stand trial on the kidnapping as well as a weapon’s charge. This entry was posted on Sunday, June 2nd, 2013 at 2:20 am	and is filed under 2001: A SPACE ODYSSEY, David & Lisa, FILMS, KEIR DULLEA, Sasha Coe. You can follow any responses to this entry through the RSS 2.0 feed. You can leave a response, or trackback from your own site. Wow I remember reading this. This must’ve been really scary for Keir and Susie. At least nobody got kidnapped in the end.